Can you learn Algebra in 24 hours? How long does it take a typical student to learn algebra? This is a tough question, for a variety of reasons. Who is a "typical" student? How do you know if they've really learned the material? And what's the best way to measure the total time a student spends learning? To get a rough estimate, consider a typical high school or college course: a student will spend about 6 hours per week in a yearlong course (or about 12 hours per week over a semester), which add ups to about 200 hours, a figure that includes both time in the classroom and homework. 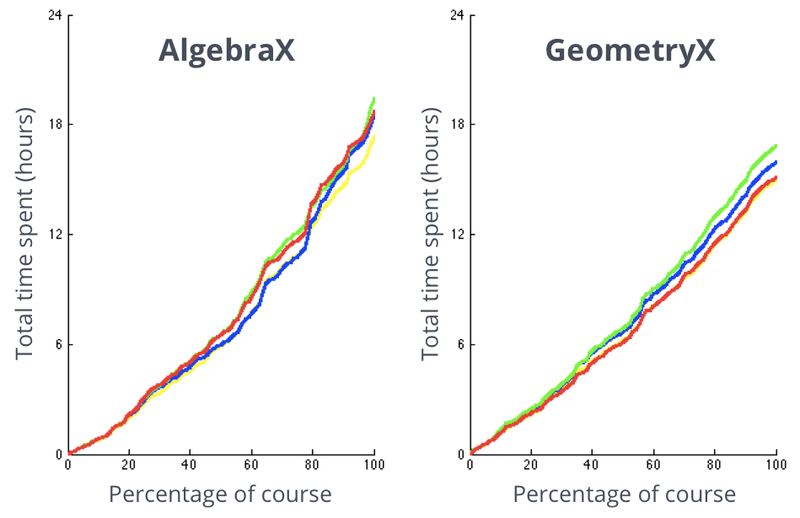 With almost 40,000 students now enrolled in AlgebraX and GeometryX, our two courses on the edX platform, we were curious to see how much time students were spending on each course, and how this compares to the 200-hour figure. Now because the lessons and assessments of our courses are adaptive, different students spend different amounts of time. So to study a "typical" student, we added up all the median times that students spend on each lesson and assessment. To estimate an upper bound of how long students might spend, we also added up the 90th percentile times of the lessons and assessments, representing the slowest 10% of students. We were definitely surprised by the results. As you can see in the graph below, the median total time to complete AlgebraX is less than 24 hours! And the same goes for GeometryX! 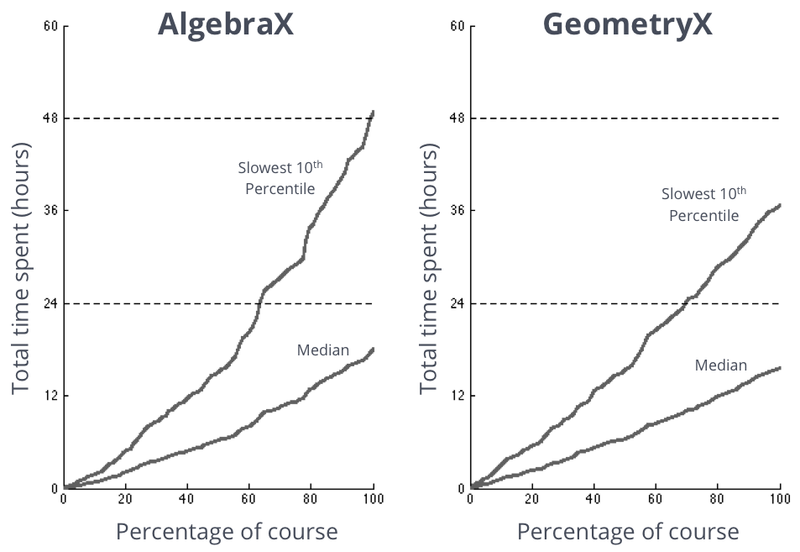 The slowest 10th percentile of students take about twice as long, finishing AlgebraX in about 48 hours, and GeometryX in about 36 hours. Total time spent on lessons and assessments in AlgebraX and GeometryX. For each course, the lower curve shows median time, while the upper curve shows the slowest 10th percentile of students. Next, we compared the median times for students with different backgrounds: 1) current high school students, 2) adult learners with no college degree, 3) learners with an Associates or Bachelors degree, 4) learners with a graduate degree. As you can see in the graph below, the surprise this time was that all four groups typically finished the coursework in the same amount of time. Median time spent on AlgebraX and GeometryX by students with different backgrounds: 1) current high school students (red), 2) adult learners with no college degree (green), 3) learners with an Associates or Bachelors degree (blue), and 4) learners with a graduate degree (yellow). So what does this all mean? First off, this does not mean that our students have been learning algebra or geometry from start to finish in a single day. We're talking about the total time spent within the courses, which most students complete over multiple weeks. Also, while we stratified students by educational background, edX students are probably not your "typical" students. And while students demonstrate mastery of the subject material by completing formative and summative assessments, this does not represent a rigorously designed study of precisely what a student has learned. But what these results do suggest is that with adaptive lessons and assessments, it appears possible for the majority of online students to work through and demonstrate competence for a year's worth of course content in a fraction of the time. It seems quite plausible that a "typical" student can learn algebra or geometry in less than 24 hours.